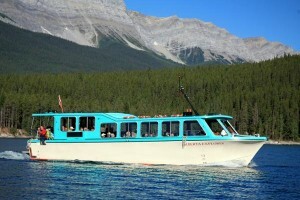 Banff National Park boat tours run on Lake Minnewanks throughout the summer season. A short drive from the town of Banff, Lake Minnewanka (Lake of the Water Spirit) is the largest body of water in Banff National Park. Mount Inglismaldie (2,964 meters/9,720 feet) and the Fairholme Range form an imposing backdrop. The reservoir was first constructed in 1912, and additional dams were built in 1922 and 1941 to supply hydroelectric power to Banff. Banff Lake Cruise is a 90-minute cruise to the far reaches of the lake, passing the Devil’s Gap formation. Even if you don’t take to the water, it’s worth parking at the facility area and going for a short walk along the lakeshore. You’ll pass a concession selling snacks and drinks, then the tour boat dock, before entering an area of picnic tables and covered cooking shelters – the perfect place for a picnic. Children will love exploring the rocky shoreline and stony beaches in this area, but you should continue farther around the lake, if only to escape the crowds.